Story: A weapons deal in Berlin, which North Korean agent Pyo Jong-seong (Ha Jung-woo) wants to finalize, goes wrong as suddenly the Mossad turns up. After that the South Korean secret service is in a tight spot because actually the unit led by Jung Jin-soo (Han Suk-kyu) wanted to stop the weapons deal and arrest Pyo as he is a completely unknown party to them in their dangerous investigations, but the North Korean secret agent manages to escape. Jung now needs to find out how the Mossad knew about the deal. There seems to be a double agent and Pyo wants to find that person as well. But Pyo's investigation brings to light unpleasant facts. Either his own wife Ryun Jung-hee (Jeon Ji-hyun) is the traitor or her boss, a high-ranking North Korean ambassador. Pyongyang also doesn't like what's unfolding in Berlin and so they send agent Dong Myung-soo (Ryoo Seung-beom) who is supposed to test loyalities and eliminate traitors. Especially Pyo's loyality is put to the test, but he isn't just on one blacklist. Review: First off, it needs to be noted that there is no better espionage movie with an international flair from South Korea than "The Berlin File". Director Ryoo Seung-wan has almost definitely earned his ticket to Hollywood with this action thriller. Though the plot might be a bit generic and presented in an unnecessarily intricate manner Ryoo brings a fresh breeze into the genre when it comes to the action and delivers some of the best scenes in years. Apart from that he can score with a great atmosphere which reminds you of those espionage thrillers that take place during the Cold War without his work lacking contemporary polished pictures at any time. Therefore, it's especially an international audience which normally doesn't concern itself with Asian cinema which will be positively surprised. "The Berlin File" certainly isn't without some serious problems and they arise when it comes to the story. Actually, there are the same disruptive fators as with so many other espionage thrillers. First it's incredibly exhausting to mentally take in all the names and parties as well as their relationships with each other. Has this obstacle been overcome new relatioships masked as plot twists come up. Betrayal, defectors, deception, all of this can be found in abundance. This information overload almost makes you question your mental capacity, but given enough time to let everything sink in the first plot holes become apparent and the story proves to be needlessly convoluted. More doesn't equal smarter. In the end, espionage thrillers are always about the same, only the names and parties involved get replaced. Unfortunately, similar difficulties concerning the characters arise. They remain shallow, especially Jeon Ji-hyeon ("Daisy", "My Sassy Girl") normally does a better job. Han Suk-kyu ("Villain and Widow", "Eye for an Eye") is feeling so uncomfortable in the scenes he needs to speak English in that he looks completely wired in them. 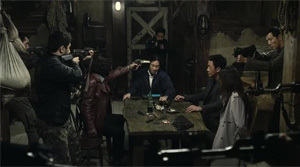 However, Ha Jung-woo ("The Yellow Sea", "Nameless Gangster") gives his role quiet professionality which especially pays off during the action scenes. But only Ryoo Seung-beom ("The Suicide Forecast", "No Mercy"), the director's brother, once again manages to really shine in his role, even to that extent that he outshines everyone else. The movie's highlight without a doubt is the action. Not only is it executed in an innovative fashion, director Ryoo is also capable of instantly captivating the viewer again should he have tuned out because of the story. Ryoo can handle shootouts, always capturing them very stylishly without ever having to rely on cheap slow motion sequences, as well as chasing and close combat scenes. Particularly latter ones are executed really excellent, which shouldn't suprise anyone since Ryoo had already put his focus there in "The City of Violence" or "Arahan". Just this time the fights look like you would expect them to be performed by a perfectly trained agent, actor Ha is physically putting himself into those scenes fantastically and he also bleeds if needed. The dynamic of of those action sequences is truely breathtaking. Moreover, I shouldn't foget to mention that the movie takes place in Germany, Berlin to be exactly as the title already revealed. Since this is the home country of the writer of these lines it can be stated with satisfaction that there are no embarassing mistakes to be found in the sets as is usually the case with so many Hollywood productions. Ha even speaks some articulate words of German. 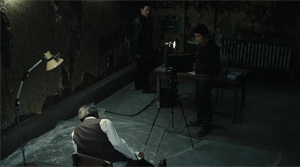 Germany in fact looks as it is depicted here, but Ryoo also manages to bestow something dirty and nihilistic on the otherwise polished explosive thriller with his sets, including some run-down apartments. The finale can't keep up with those sets, but the movie still looks like more than "just" a ten million Dollar production. The drama towards the end sadly isn't fully convincing, but as already stated there is enough positive stuff to make up for that. Fans of the genre can't go wrong with "The Berlin File" anyway.